In the late 1970s the bottom of the tunnel showed signs of lifting and in 1979 the tunnel was closed until it briefly re-opened in the summer of 1980 with BW crewing boats through. By late 1980 early 1981 such was the movement of the tunnel bed the walls were found to be lacking support and the tunnel was closed. £4.3 million pounds was the cost of removing the centre section of the 3km tunnell and lining it with pre cast concrete rings. The tunnel re-opened to boats on 22 August 1984 hence the 25th Anniversary celebrations. Some pictures can be found HERE and don`t forget to click part 2 at the bottom of the page. but for me the highlights were a talk and slide show by 2 of the tunnel engineers from Mowlem who were on the lining team. Following the talk i sat in the Museum and watched the archive news reports and other film clips made during the repair. Out on the canal Tunnel trips were very popular with the public with the majority just going a short distance into the tunnel whilst a full length trip could be made with the option of a return journey by vintage bus. The 2 trip boats providing the trips were `Charlie` & `Indian Chief`. Along the towpath leading to the tunnel several boats were selling their wares. The Fudge boat above and the Cheese boat below both handing out samples and hopefully making sales. NB Sculptor built 1935 it`s wooden bottom now needing urgent repair was used in WWII as a fire boat in London but spent most of it`s life carrying cargo between London and Birmingham. All day Saturday a steady stream of people got to see the living quarters of a working boat family and what you see in the pic is it, about 8 feet long. Above the Milton Keynes Play Association boat` Funion Bargee` was on hand to keep the kids amused both on board and on shore. Below the only usual fitting is the galley at the rear the rest is just a play area. If anyone missed the w`end celebrations the next event is "Village at war" Oct. 3-4th follow link to the left of the page. been causing problems for boats entering/exiting the tunnel for some considerable time. Fate is a funny old thing eh!, there i am waiting to start the Braunston flight of double locks hoping for someone to follow along and make the journey easier when just as i had entered the first lock along comes a boat. And here started the most enjoyable 2 days for a while because the boat that will remain nameless was crewed by a solo lady who will remain nameless for reasons of her privacy, well you know what the towpath telegraph is like and as she was so nice i wouldn`t want to cause any embarrassment. After the Braunston flight we stopped for a cuppa and after doing just the top lock at Buckby we retired to the New Inn for a drink and so comfortable was i in her company offered to cook dinner and to my delight she accepted. Sadly we parted company at Weedon so if you read this my new found friend please e mail from the "my profile" bit over on the right. show the following pics taken from up front where the tunnel light lit up the tunnel. above the picture clearly shows the concrete segments used back in the 1980s to reline the near collapsed middle section. It is in fact today the 25th anniversary of the tunnel re-opening and i am at Stoke Bruerne for the celebrations but more on that next time. so i know i`m pretty laid back and lose all track of time but surely i can`t be in London already. No all is ok through the bridge and open fields so it must be another Elephant & Castle. e mail the picture and my hanging suggestion and see if they have a sense of humour. A nice growth of Fungi on what would have been a boring dead tree halfway through the Hillmorton locks. Maybe the boat that usually moors here is called Fungi and this is a living sign. it`s Pip & Roger on Windsong. Nowhere to moor as usual so just a quick hello and until we meet again enjoy. Looking through the bridge at Hartshill towards Nuneaton the hill in distance is man made of rock and spoil from the stone quarries. Granite was a common product in this area and the spoil was piled high to limit the amount of land taken up. From Hartshill Quarrymans walk is a series of signposted walks that take you past the now mostly un-worked quarry`s although as you get nearer Nuneaton some are still working. Another attraction in Hartshill is the 13c Castle or what remains of it. and not so old or big are these miniature horses that passed Nb Valerie on their daily walk. Below is the old entrance to the Griff Arm and as is usual with me i had a `Google` and was amazed to learn that this didn`t just go off to service Griff colliery but in fact joined a network of canals built by Sir Roger Newdigate between 1769 & 1796 to transport coal and produce around the Arbury Hall estate. The canals were fed by streams and pools in the grounds and stretched for 6 miles with 13 locks of 40`x6`. 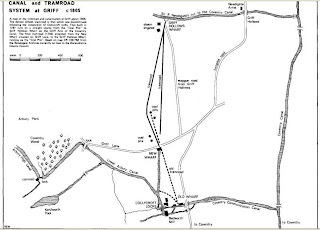 These canals and tramways and in later years an amazing complex of railways served collieries, brickyards and quarries. There were 2 connections to the Coventry canal, the Griff Hollows canal (Griff Arm) in use until 1961 when the pit closed and the Coventry communications canal near Bedworth Mill more towards Bedworth. Must try in the future to locate this as the only other arm i have found is the Newdigate arm by brdg 13 but i`m thinking this might be to far down. Click the images below to see the map enlarged and the text bottom of map. Amazing what you pass by as you cruise who would have thought behind this overgrown corner existed such a complex system and i have made a mental note to get the walking boots out next time i pass and see what remains of it all. Below is the Turnover bridge that enabled horse drawn boats to enter the arm. The existing towpath is on the left and the horse could walk over the bridge without un-hitching the towline to the towpath that can still be seen leading into the arm behind my position taking the pic. Must say hello to Gilbert & Jude from New Zealand who aboard NB Mair spend each summer cruising the canals. it must be 2 yrs since we last met so it was good to catch up over a coffee on board NB Valerie. Gilbert you have left your hat on board so when we meet possibly on the Gd. Union i will trade it for a coffee. the cooker will be ready for a coat of wood stain and 2 coats of lacquer giving the finish below. The problem i had was the 16/24hrs drying time between coats and so the dinette became a temporary work surface and the plates etc piled up while the sink area opposite was given the same treatment. Atherstone Station built Jacobean style in 1847 still stands following local campaigners saving it from demolition in 1980. It is now used as a veterinary practice who will sell you a flea treatment but not a train ticket. The top lock of a flight of 11 at Atherstone is always a relief for those coming up with the thought of a long length before any locks need negotiating. I left Polesworth at 7.30 as the weather turned sunny and i wanted to do the 11 before the sun got to hot and as i started at the bottom 3 other boats followed me up possibly with the same idea. After being away at the wedding it was time to move out of the Marina and get used to living without an electric hook-up and also it was nice not to have a boat moored just a few feet on each side. Can`t imagine how people living in marinas put up with being hemmed in like that but i suppose they are working and living on a boat for reasons that suit them so each to there own, live and let live is my thought on the subject. I chose to leave the boat in Gt. Haywood Marina following recomendations from other boaters and i would encourage others to moor here as the staff were both helpful and friendly. The only niggle i had was i had to remove my winter stockpile of logs from the roof to the cratch as the rules say no untidy roofspace. The chap in the office was very nice explaining that if he let me in with the roof wooded then the residents would kick up even though i was just a temporary moorer. Still rules are rules and it took just 25mins to put the logs into the cratch area. So exiting the Marina and the plan was to head for Rugely and re-stock the galley but the weather had other ideas and as i entered the first lock at Gt. haywood the heavens opened and before i could reach inside for a coat i was soaked and i mean as if i had fallen overboard so sudden and heavy was the rain. So the plan that was now wasn`t anymore and after leaving the lock i squelched up i mean moored up and a change of clothes and a cuppa led to a night stop. 13 with a grp cruiser and a day boat turning back the delay was almost 2 hrs and all for a bit of wood stuck under the gate, oh well that`s boating. Seems to be a lot of police biking the towpaths nowadays and if they all smile like this one i`m all for it. Back at Stone a couple stopped and i refreshed them with a cold drink, yes it was hot and sunny then and the way the weather is of late i`m thinking that was summer. Passing Alvecote Marina a few working boats were moored outside the Samuel Barlow pub and not having seen them before i can only imagine they are returning from a show or going to one . So my plans are now to head south and go through London and onto the Rivers Lee & Stort but that might change have to see how it goes. I nearly decided to stop blogging as i wasn`t seeing much just the open fields and not much in the way of, history i`m told by other boaters is my blog style, things to delve into that others might find of interest. But for now i`ll just see how it goes and maybe add in some other bits and pieces. Must say hello to the crew on 4Evermore and Shipperke who called out they read the blog as they cruised by.